Save thousands of dollars in legal fees without the cost of an attorney. 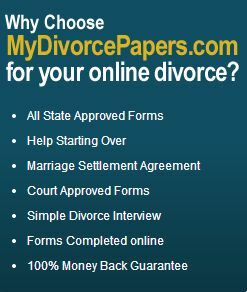 100% GUARANTEE OF COURT APPROVAL OR YOUR MONEY BACK..
Our simple and inexpensive process will enable you to complete your divorce documents from the comfort of your home, without incurring the cost of an attorney, or dealing with lengthy completion and delivery periods. We are one of the leading providers of a do it yourself divorce preparation service. We make divorce easy because your documents are done right. There is no need to fumble through forms or read pages of instructions. We'll prepare your documents and deliver them online in real time.